The officers and sailors of USS KITTY HAWK are proud to serve aboard the oldest active ship in the U.S. Navy, commissioned April 29, 1961 and named for the site of the first successful powered flight by the Wright brothers in 1903 -- Kitty Hawk, North Carolina. The aircraft carrier USS KITTY HAWK is the first in a class of three super carriers. Constructed by the New York Shipbuilding Corporation at Camden, N.J., KITTY HAWK was commissioned at the Philadelphia Naval Shipyard on April 29, 1961. It is the second U.S. Navy ship named after the small North Carolina town near which Orville and Wilbur Wright flew the first manned aircraft on Dec. 17, 1903. Following commissioning, KITTY HAWK’s first commanding officer, Capt. William F. Bringle, sailed his new ship around South America to her new homeport in San Diego, Calif.
Preparations for the ship’s first extended Western Pacific (WESTPAC) deployment were completed and KITTY HAWK departed San Diego in September 1962, returning the following year. From 1963 to 1972, KITTY HAWK and Carrier Air Wing ELEVEN (CVW-11) completed eight extended deployments, including six in support of American forces in Vietnam. During that period, KITTY HAWK was awarded a Presidential Unit Citation, a Meritorious Service Commendation, four Navy Unit Commendations, a Battle Efficiency "E" and many other unit awards. Also, Lt. C.E. Klusmann of VFP-63, Det. C., was awarded the Distinguished Flying Cross for his participation in photo recon missions. In January through July 1973, KITTY HAWK changed homeports from San Diego to Hunter's Point. Hawk moved into drydock January 14 of that year and work began to convert the ship from an attack (CVA) to a multi-mission carrier (CV). The "CV" designation indicated that Hawk was no longer strictly an attack carrier in that anti-submarine warfare would also become a major role. Hawk became the first Pacific Fleet carrier to carry the multi-purpose "CV" designation. The conversion consisted of adding 10 new helicopter calibrating stations, installing sonar/sonobuoy readout and analysis center and associated equipment, and changing a large portion of the ship's operating procedures. One of the major equipment/ space changes in the conversion was the addition of the Anti-Submarine Classification and Analysis Center (ASCAC) in the CIC area. ASCAC worked in close conjunction with the ASW aircraft assigned aboard within Carrier Air Wing ELEVEN. During the yard period, the Engineering Department underwent a major change in its propulsion plant. The Navy Standard Oil (black oil) fuel system was completely converted to Navy Distillate Fuel. The Air Department added several major changes to the flight deck, including enlarging the jet blast deflectors (JBD) and installing more powerful catapults in order to handle the new Grumman F-14 Tomcat, which Hawk was standing by to receive for its next deployment. Enlarging JBD#1meant the Number One Aircraft Elevator had to be redesigned, making Hawk the only carrier at the time having an aircraft elevator which tracked from the hangar deck to the flight deck angling out six degrees. Hawk moved out of drydock on April 28, 1973 and the next day, on her 12th birthday, was named a Multi-Purpose Aircraft Carrier (CV). Hawk stayed busy throughout the mid-1970s with numerous deployments to the Western Pacific and involvement in a large number of exercises, including RIMPAC in 1973 and 1975. KITTY HAWK departed San Diego on March 8, 1976 and on March 12 entered drydock at Puget Sound Naval Shipyard in Bremerton, Wash, to commence a 100-million dollar complex overhaul scheduled to last 12 and a half months. This overhaul configured Hawk to operate with the F-14 and S-3A "Viking" aircraft in a total CV sea control mode. This included adding spaces for storage, ordnance handling and maintenance facilities for the two aircraft. Also included in the work package were more efficient work areas for air frames and a repair facility for ground support equipment and the addition of avionics support capability for the S-3. The ship also replaced the Terrier Surface-to-Air missile system with the NATO Seasparrow system, and added elevators and modified weapons magazines to provide an increased capability for handling and stowing the newer, larger air launched weapons. Hawk completed the overhaul in March 1977 and departed the shipyard April 1 of that year to return to San Diego. In 1979, the ship teamed with Carrier Air Wing FIFTEEN (CVW-15) for another WESTPAC deployment, which included Vietnamese search and assistance operations ordered by then-Commander-in-Chief President Jimmy Carter to aid Vietnamese refugees who were attempting to escape the Socialist Republic of Vietnam via small boats. During that deployment, Hawk also offered contingency support off the coast of Korea following the assassination of Republic of Korea President Park Chung Hee. The deployment was then extended two-and-a-half months to support contingency operations in the North Arabian Sea during the Iranian hostage crisis. For their actions in the region, KITTY HAWK and CVW-15 were awarded the Navy Expeditionary Medal. KITTY HAWK returned to San Diego in February 1980 and was awarded the Meritorious Unit Commendation and the Naval Air Force Pacific Battle Efficiency "E" as the best carrier in the Pacific Fleet. 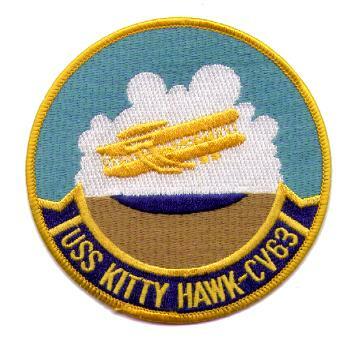 In April 1981, KITTY HAWK left San Diego for her 13th deployment to the Western Pacific. Following the cruise, the crew was awarded the Navy Expeditionary Medal and the Humanitarian Service Medal for the rescue of Vietnamese refugees in the South China Sea. In January 1982, KITTY HAWK returned to Bremerton for another year-long overhaul. Following the comprehensive upgrade and a vigorous training period with Carrier Air Wing TWO (CVW-2), KITTY HAWK deployed in 1984 as the flagship for Battle Group Bravo. KITTY HAWK logged over 62,000 miles on this deployment and remained on station in the North Arabian Sea for more than 60 consecutive days. The ship returned to San Diego on Aug. 1, 1984. Seven months later, KITTY HAWK was awarded another Battle Efficiency "E" award. In July 1985, KITTY HAWK and CVW-9 deployed again as flagship for Battle Group Bravo. KITTY HAWK and CVW-9 combined to set a standard for operations, completing their second consecutive fatality-free deployment. CVW-9 crews logged more than 18,000 flight hours and 7,300 arrested landings while KITTY HAWK maintained its catapults and arresting gear at 100 percent availability. KITTY HAWK bid farewell to San Diego on Jan. 3, 1987, as the ship departed her homeport of 25 years and set out on a six-month world cruise. During the circumnavigation, KITTY HAWK and CVW-9 again showed their commitment to safety by conducting a third fatality-free deployment. KITTY HAWK spent 106 consecutive days on station in the Indian Ocean and was again awarded the Navy Expeditionary Medal and the Meritorious Unit Commendation for its service. The world cruise ended at the Philadelphia Naval Shipyard on July 3. Six months later, Kitty Hawk began a Service Life Extension Program (SLEP) overhaul. KITTY HAWK emerged from the yards on Aug 2, 1990. The overhaul is estimated to have added 20 years of service to the ship. With the return of CVW-15 to its decks, KITTY HAWK began its second deployment around "the Horn" of South America to its original home port of San Diego on Dec. 11, 1991. On Aug. 1, 1992, KITTY HAWK was appointed as Commander, Naval Air Force Pacific’s "ready carrier." The ship embarked Commander, Cruiser-Destroyer Group FIVE; Commander, Destroyer Squadron SEVENTEEN and Carrier Air Wing FIFTEEN for three months of work-ups before deploying to the Western Pacific on Nov. 3, 1992. While on deployment, KITTY HAWK spent nine days off the coast of Somalia supporting U.S. Marines and coalition forces involved in Operation Restore Hope. In response to increasing Iraqi violations of United Nations sanctions, the ship rushed to the Arabian Gulf on Dec. 27, 1992. Just 17 days later, KITTY HAWK led a joint, coalition offensive strike against designated targets in southern Iraq. The Hawk set sail on its 17th deployment June 24, 1994, providing a stabilizing influence operating in the Western Pacific during a time of great tension in the Far East, particularly concerning North Korea. 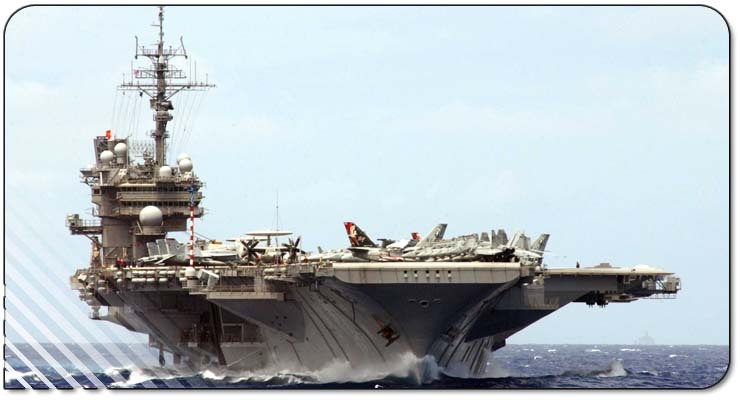 KITTY HAWK began her 18th deployment in October 1996. During the six-month underway period, the ship visited ports in the Arabian Gulf and Western Pacific. The Hawk returned to San Diego April 11, 1997, immediately beginning a 15-month, $110 million overhaul, including three months in drydock in Bremerton, Wash., from January to March 1998. KITTY HAWK departed San Diego on July 6, 1998 to assume new duties as America's only permanently forward-deployed aircraft carrier from USS Independence (CV 62). Hawk also welcomed aboard Carrier Air Wing FIVE, operating from Atsugi, Japan. KITTY HAWK arrived at her new homeport of Yokosuka, Japan, on Aug. 11, 1998. The Hawk set sail for a planned three-month deployment March 2, 1999, that included Exercise Tandem Thrust off Guam. Following the exercise, the Hawk/FIVE team was ordered to the Arabian Gulf to enforce the No-Fly Zone over Southern Iraq. CVW-5 pilots flew over 8,800 sorties in 116 days, including 1,300 combat sorties, dropping more than 20 tons of ordnance. On the return trip to Japan, KITTY HAWK made port visits to Perth, Australia, and Pattaya, Thailand. Hawk returned to Yokosuka Aug. 25, 1999. She then deployed to the Sea of Japan Oct. 22 to participate in Exercises FOAL EAGLE and ANNUALEX 11G. On April 11, 2000, Hawk departed Yokosuka, Japan for routine local area operations and to participate in Exercise Cobra Gold with the navies of Singapore and Thailand. Hawk participated in Exercise Foal Eagle in Fall 2000, and deployed again in March 2001 for a Spring underway period with a couple of historic stops. First, on March 22, KITTY HAWK became the first aircraft carrier to ever moor pierside in Singapore, as Hawk visited the brand new Changi Pier, located at the Republic of Singapore's Changi Naval Base. Then, shortly after a visit to Guam, Hawk turned 40 years old on April 29, 2001.